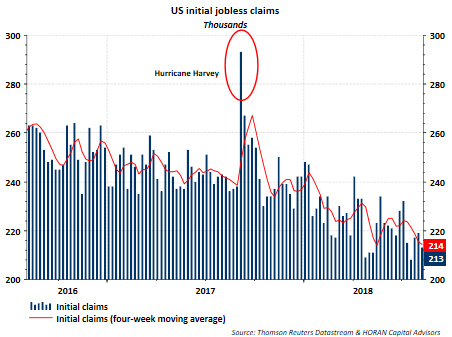 Further evidence of a tight labor market is seen in today's decline in weekly jobless claims to 213,000. This was the first decline in the last three weeks and the 4-week moving average of initial claims continues its trend lower. This report coincides with Tuesday's JOLT report that shows job openings continue to exceed job hires as well. Jobs are plentiful at the moment.